Blast Furnaces normally generate 250 to 350 Kg of liquid slag for every ton of hot metal produced. This molten slag is at around 1400 – 1550 deg C temperature. Till seventies blast furnace (BF) slag was considered a waste product and was being dumped at a convenient place away from the blast furnace. During early seventies granulation of molten slag with high pressure water started near the slag dumps. The processes of granulation of molten slag were developed during late seventies and early eighties. The processes differ in the method of dewatering of the wet granulated slag. Today granulation of molten BF slag is the well accepted technology and is being used in most of the blast furnaces around the world. In India the credit of commissioning the first cast house slag granulation plant goes to Visakhapatnam Steel Plant when the first blast furnace of the plant was commissioned on 28th march 1990. Major slag granulation processes presently under operation are OCP granulation system, Gipromez designed plants, Rasa system and INBA slag granulations plants of Paul Wurth, modified INBA process or IDE process etc. It is necessary the exchange of heat between the molten slag and high pressure water to take place in a very short time. 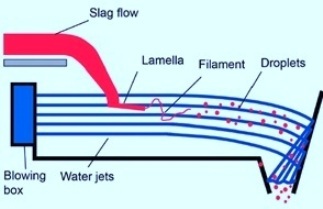 The high pressure water jet breaks the molten slag stream into molten slat lamellae which initially convert into filaments and then into droplets. Maximum heat transfer takes place when the contact surface between the molten slag and the water for granulation is maximum ie. When the molten slag has been converted into droplets and is fully enclosed with water. The time of the solidification is dependent on the size of the slag droplets, the difference of temperature between the molten slag and high pressure water and the contact environment between water and the slag. Depending on the water temerature around the slag droplets, the transfer of heat takes place due to the following mechanisms. Heat removal through steam release – This is applicable if the temperature of the granulation water is equal to the boiling temperature of the water. Heat transfer to the granulation water as well as heat removal through steam release – Heat transfer through this mechanism takes place during most of the time. Heat transfer to the granulation water without heat removal through steam release – This happens if the temperature of the granulation water is low and allows immediate condensation of the generated steam. Generally boiling temperature is not reached when cold water is used for the granulation except in local areas due to the transient high slag flow. Removal of heat without steam release is feasible in case of use of cold water for the granulation and with good turbulence between slag and water for optimum heat removal. However normally heat transfer take place through the granulated water as well as through steam release. The process of cast house slag granulation starts with separation of molten slag from liquid hot metal. The molten liquid slag is led into the granulation chamber through a series of runners protected by lining and sand. Direct contact between pressurized water stream and molten liquid slag takes place in the granulation chamber. Due to rapid cooling and the impact of water pressure, the molten slag is granulated into vitreous sand like particles which form a slurry mixture with water. This slurry mixture of water and granulated slag is transported to the dewatering station. The simplest dewatering method is through gravel layered filtering bed. This filter bed is periodically back washed with water and air for removal of the choking by small particles of the slag. The most popular dewatering equipment is the rotating dewatering drum of INBA process. The granulated slag and water slurry is distributed evenly over the whole length of the drum. Axial vanes inside the drum continuously lift the granulated slag and deposit it onto a conveyor belt located above the distributor. The fine mesh on the exterior of the drum retains the granulated slag and allows the water to filter through. The granulated slag layer at the bottom of the drum creates a self filtering effect. After dewatering the residual moisture of the granulated slag is around 8% to 10 %. The dewatered water is cleaned, cooled and recycled. The dried slag is conveyed to the granulated slag storage for dispatch to the customers. Water vapours generated during the slag granulation are emitted through a stack normally made of stainless steel. While the first two parameters relates to the blast furnace operation, the last two parameters are related to the granulated water temperature, granulated water pressure and flow and the granulation area available for heat transfer. Besides the emission of steam, gaseous sulphur compounds (mainly H2S and SO2) are generated and emitted during the granulation process. BF slag contains around 1 % -2 % of sulphur in form of calcium sulphide which reacts with water and oxygen as per the following equations. These reactions occur mainly at temperature above 1100 deg C.
Eliminates slag dumping and hence all the drawbacks associated with it. Investment and operating costs are lower than the costs associated with the slag dumping. Reduces manpower when compared with slag dumping. The process can be fully automated. Saves on land area needed for slag dumping. Compact design of granulation plant needs only a small area. Since it is installed adjacent to the cast house of the blast furnace, it helps the blast furnace operation because of continuous flow of data from the granulation plant. Very informative article. Whether slow cooling of blast furnace slag has ever been tried directly from slag runner? If yes, please inform. Slow cooling of slag will not impart those properties to the slag which are required for cement making.